The last time Karrie Wurmann visited Carcross was in 1994, when she visited her biological family for the first time. The last time she visited the small town about an hour south of Whitehorse was in 1994. That was the first time she visited since she was a child, and also the first time she met her biological family. Karrie’s biological family is from the Carcross/Tagish First Nation, an inland Tlingit and Tagish community whose traditional territory surrounds the town of Carcross. But she was never raised in Carcross — she was adopted when she was only 10 months old. Karrie is also my aunt. It was my German-Canadian grandparents who adopted her when they were living in Whitehorse in the 1960s. They lived in the Yukon until Karrie was six years old before moving to Germany and later settling in Alberta. This is why Karrie had a difficult time when she last visited Carcross. “I remember being so stressed and so anxious that I couldn’t eat,” she says, recalling how overwhelming it was to meet her entire biological family. One moment that stands out in particular is when she met her biological grandfather. “I remember his first words quite clearly were, ‘You’re home. You’re back home with your family,'" Karrie says. “And I just remember kind of stiffening up a bit and going, ‘I don’t know you, and this isn’t my home.'" Karrie’s brother Danny is a leader of the Ishkahittaan clan, which is represented by the frog emblem. Karrie and Danny have kept in touch since Karrie’s visit in 1994, although most of that communication has been over social media. Although she was supposed to stay in Carcross for two weeks, Karrie cut her visit short after only a few days. A lot has changed between then and now. In 1994, Karrie had no idea that she was part of a pattern of Indigenous children who were adopted out of their community and into non-Indigenous families. Today, she has heard the stories of other Indigenous adoptees like her and recognizes that she was part of what is known as the Sixties Scoop. More than 11,000 Indigenous children were adopted between 1960 and the mid-1980s, according to statistics from Indigenous and Northern Affairs Canada, although some say that number is much higher. There are reports of children being physically taken from their families, and some survivor advocates connect the Sixties Scoop with other policies such as the Indian residential schools system as part of an attempt at cultural genocide. Learning about this history was one factor that encouraged Karrie to return to Carcross after all these years. When the story pole is raised, the entire community helps pull the ropes to lift the pole off the ground. Karrie and I were always close. When I was younger she gave me picture books with Tlingit folk tales for Christmas and birthday gifts, and when I visited her she would take me fishing near her home in the Okanagan. I tagged along when my aunt returned to Carcross this past July. I told her I wanted to make a radio documentary about her experiences reconnecting with the community, but I was also there to support her. Karrie’s brother Danny is a leader of the Ishkahittaan clan, which is represented by the frog emblem. This time, Karrie kept her visit short. 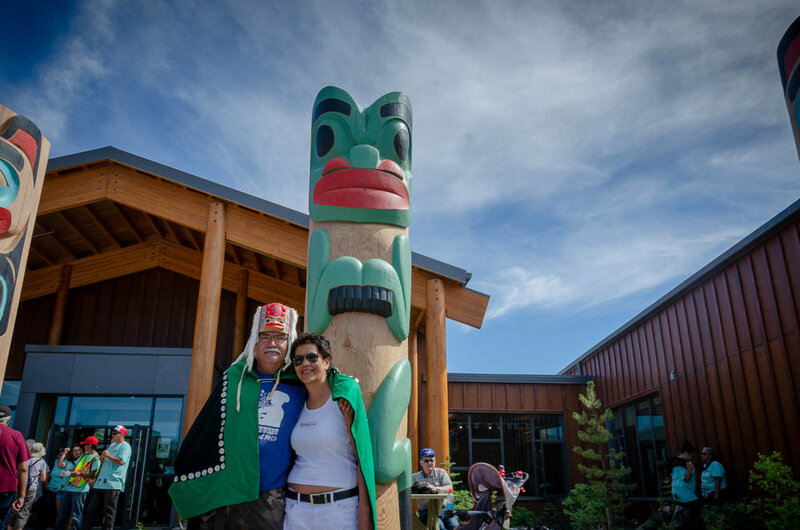 She only had three days to spend in the community, starting with a totem pole raising ceremony in Carcross. For the rest of her time in the Yukon she reconnected with family she hadn’t seen in years and visited the gravesite of her biological mother, who died in 2014. I had been in the Yukon for nearly a month before Karrie arrived at the end of July. I was in the territory with Stories North, learning about how to respectfully and responsibly report about issues affecting Indigenous communities in the area. In the weeks leading up to Karrie’s arrival I tried to spend as much time as possible in Carcross. I spoke with many Carcross residents, including members of my aunt’s biological family. It was important for me to make connections in the community before waltzing in with my recorder and microphone. Carcross is a small community, so everyone I met knew Karrie’s biological family and many knew about Karrie too, either from stories or from meeting her during her last visit. After learning about my connection to Karrie, people were happy to sit down and speak with me, and in some cases I was even welcomed as a friend or as a member of their extended family. Reflecting on this experience weeks later, I still feel overwhelmed by this warm reception, and I am endlessly grateful for their openness and kindness. Although Karrie’s mother Mary Ann died in 2014, her grandmother Winnie Atlin still lives in Carcross. After the pole raising, Karrie met with Winnie, who taught her granddaughter some words in Tlingit. In these conversations it became clear that no family in Carcross has been untouched by policies such as the Sixties Scoop that separated Indigenous children and their families. Every person I spoke to knew someone with a story similar to Karrie’s, and the trauma caused by these policies, from the residential school system to the foster care system today, is felt deeply in the community. There are also many stories of hope. I heard about people who were adopted or taken away from Carcross as children returning in adulthood to make positive contributions to their community. Eileen Wally works as a support worker for the Carcross/Tagish First Nation, and is also the cousin of Karrie’s mother Mary Ann. I was touched by my experiences with Karrie in Carcross, and I know my aunt was affected as well. Although she had previously said she would never return to the community, she’s now open to the possibility of returning again in the future.